family home until 1903, at which time he retired from active life. They then located at Ansley, here he purchased a good residence and ten acres of land, which they still occupy. In public affairs Mr. Gleason takes an active interest, and he served five years as assessor, and during most of the time since he came to the state has field various offices on the school board of district number sixty-seven. He is a promoter of every measure calculated for the general good, and is considered a substantial, reliable citizen. Both he and his wife have a wide circle of friends and they have reared their children to patriotic views regarding their adopted state. They have four children, namely: Marcus, living at home; Fannie married A. Stuckey, of Ansley, and they have four children; Betty, married F. A. Betts, of Oregon, and they have ten children; Mary is the wife of S. C. Bruner, of David City, Nebraska, and they have one child. Mrs. Gleason's parents were both born in New York and died in Michigan. She has a sister and three brothers in Michigan, a sister in Oklahoma and a brother in Nebraska. The Calvin family is familiar to all who have lived in Howard county and the surrounding country, and the gentleman whose name heads this personal history is widely known as one of the very earliest pioneers of that part of Nebraska. He has seen every change which has come to his vicinity, and in its progress has been an important factor, doing fully as much in bringing about its present prosperity as any other one man in the county. David A. Calvin was born in Mercer county, Pennsylvania, on February 27, 1837, and made that locality his home until he was seventeen years of age. There were eight children in his parents family, he being next to the youngest, and of this large family but himself and one sister survive. He left home in 1854 going into Illinois, where he followed farm work for about seven years, and was married there to Miss Mary Jones, in Adams county, she being a native of Indiana, their marriage occurring on New Year's Day, 1861. Two children were born to them in Illinois, and in the spring of 1865 the little family moved to Iowa, settling in Polk county and spending about seven years in the state. They then started by wagon train to Nebraska, and while on this trip were overtaken by the terrible April storm, which will be remembered by many of the old-timers in Iowa and Nebraska. However, they finally landed in Howard county after a tiresome and tedious journey, and Mr. Calvin filed on a homestead in section thirty, township eleven, range twelve, and still has this homestead in his possession. There he went through every form of pioneer existence, meeting with discouragements and failures of every description, but stuck to the home and farm, and finally succeeded in making of it a valuable property, constantly adding to its acreage until he became proprietor of a large tract, all of which he has improved with good buildings, well stocked, etc. Some little time ago Mr. Calvin retired from active farm work, and settled in St. Paul, where he enjoys a comfortable home and the family have many warm friends. Mr. and Mrs. Calvin have had nine children, the four youngest being native Nebraskans. One child was lost by death, while the remaining eight are as follows: George, Mary Olive, Emeline, James Wilbert, Richard E., Lois, Curtis and John, all married and living in different parts of Nebraska, excepting Emeline, who is in Pittsburg, Pennsylvania. In many ways, truth is stranger than fiction, and the lives of many of the old settlers of the west contain many incidents, which if related, would be even more entertaining than any form of fiction. This is especially true of the above, whose life in the mining regions of Montana in the days when the country was new, is replete with many startling incidents. While here he was at times prospecting with such men as Wm. A. Clark, Jim Whitlatch, although none of them had any cash to spare at that time. He was secretary of the organization known as the Vigilance Committee when it formally disbanded in Montana. He is also a Civil war veteran, having served on detached duty away from his regiment as scout and courier, most of the time, and was in the engagements in and about Decatur, Nashville, Knoxville, and at Fort Donaldson. Later on, he came to Nebraska in the early days of its settlement and lived and saved and suffered as others did. James G. Holden was born in Canada on the second of April, 1844, and was the youngest of the four children born to James and Chloe M. (Wood) Holden. The father died in Canada in the spring of 1852 and the mother came to Chicago with her fatherless children, joining her two brothers who lived in Ogle county. Soon after, James was taken back to Canada and kept there two years at school. In 1858, the mother married a Wisconsin man, and thenceforth made her home in Rock county, Wisconsin, where James joined her in the fall of 1860.
then went to Omaha by wagon, from there taking the overland route via the Bozeman cut-off to Montana, with a bunch of horses and mules from Alabama. He arrived in Helena, Montana, in July, 1866, and soon established connections with the firm of Holter Bros., becoming the general manager and bookkeeper of their Helena office. He remained with them for three years, in the meantime engaging in several mining operations which were not successful. However, his education and ability secured a ready recognition among the business men of the time. In the spring of 1870, Mr. Holden returned to Wisconsin, and on July 12th, he was married to Miss Josephine Bradt in Rock county. After their marriage, Mr. and Mrs. Holden spent some months in travel, taking a trip among the principal cities of the United States. In the following spring, Mr. Holden alone came to Merrick county, Nebraska, and took up a hometsead [sic] in the northwest quarter, section fourteen, township fifteen, range four, being joined by Mrs. Holden in August of the same year. Mr. Holden has held many positions of trust and has amply fulfilled all official obligations. He was elected county clerk in the fall of 1877 and served four years, and immediately took the office of county treasurer. Just at this time he became associated with D. Martin and J. W. Sparks, and with them, organized the Platte Valley Bank, with David Martin as president, J. W. Sparks, vice president, and James Holden as cashier and manager. He severed connection with the bank in 1888, and opened up an abstract and real estate and insurance office, and he has continued in that line of business to the present date. Nine children have been born to Mr. and Mrs. Holden, six of whom are living. The eldest daughter, Hattie E., lives in California; the two elder sons, Paul and James G., junior, are both in the state of Washington; Philip is at home, in business with his father, while Dora D. and Floyd, the two youngest are still at home. Mr. Holden and family are prominent figures in the social life of the locality. and are widely and favorably known. A history of the state of Nebraska would not be complete without including a sketch of George F. Mott, who has made this region his home for some thirty years, and in that time has always done his share in the development of the agricultural resources of this section of the country. Mr. Mott was born in Ohio, in 1848; his birthplace being a farm house, and his associations, from the first, being with agricultural interests, it is natural, therefore, that he should find success in life's endeavor in the tilling of the soil. His father, F. S. Mott, was born in Baden, Germany in 1804, and passed away to the great beyond in 1888. His mother, Mary (Dentz) Mott, who was also born in Baden, her birth having occurred in 1823, is now living in Boone, lowa. Our subject's father was a shoemaker, which occupation he followed in his native country. He came to America on a sailboat being twelve weeks on the sea. Their first home was in Ohio, afterwards the family went to Wisconsin, an still later to Boone, Iowa, where F. S. Mott died. A part of the time after coming to America, F. S. Mott worked at his trade, but most of his life in America was spent in farming. Mr. Mott, our subject, in the fall of 1880, came to Knox county, Nebraska, from Iowa, where he had lived fifteen years, and took up a homestead in section nine, township, thirty, range eight, on which land he built a frame house fourteen by twenty feet. Here in the early days misfortune seemed to pursue Mr. Mott in a relentless manner, as he suffered losses of every description through drouths, prairie fires, and storms of every variety. In 1884 Mr. Mottt was burned out by the prairie fires that raged that year; in the memorable blizzard of 1888 he lost several head of cattle; in 1893 his crops were destroyed by the hailstorm of that season; and in 1894 the drouth and hot winds burned the crops, making a total failure of them. But Mr. Mott still kept faith in the ultimate success of this region, and has been well rewarded for his faithfulness and perseverance. He now owns nine hundred and twenty acres of some of the finest land in this section of the county, which he has improved greatly. He has twenty acres of fine trees. February 9, 1876, Mr. Mott was united in marriage to Miss Josephine Weaver, who was born in Bohemia, and came to the United States with her brother-in-law and sister in 1871. They are the parents of fourteen children: Frank S., who is married to Miss Minnie Mohr; George J., whose wife was Miss Ida Knight; Mary, wife of John Hansen; Josephine, who is now the wife of Mr. Berthold Groeling; James, married to Julia Jelinek; Lillie, who is the wife of Walter Bramon, and William, Julia, Edna, and Peter. All those married are in homes of their own, and the last four are living with their parents. Josephine, Laura, Hattie and Minnie are dead. his upright character and honesty of purpose in all things. Mr. Havens is a son of Walter and Nancy Havens, who were searly [sic] settlers in Iowa, where he was born, December 5, 1869. He spent the first eight years of his life in Delaware county, Iowa, then came to Boone county with his grandfather, W. W. Havens, the latter settling on a farm. He was married here on February 20, 1901, to Miss Eda Dodge, of Loretto. The year following his marriage he purchased three hundred and twenty acres of fine farming land on section twenty-seven, township twenty-one, range seven, and this has remained the home place up to the present time. He has made of this place a good home and well developed farm and is classed among the leading younger pioneers of his section. Mr. and Mrs. Havens have had four children, Donald, who died in 1904, Arthur Lee, Florence and William Dale, who are all bright and charming young people. Mrs. Havens is one of a family of seven children, all now scattered in different parts of the country. Her mother lives in Loretto, her father having been dead many years. Located very pleasantly in section one, township twenty-seven, range eight, is to be found the gentleman whose name introduces this biographical sketch. Mr. Rice has been identified with the history of Antelope county from a very early date and his contributions to the welfare of this section of the state have been such as to merit the highest praise. Mr. Rice has the sterling qualities that go to make a substantial citizen. He is a man of industrious habits, persistence, honesty of purpose, and force of character. Mr. Rice was born in Jasper county, Iowa, March 9, 1869, his birth place being a farm house, and his associations from the first being with agricultural interests. It is natural, therefore, that he should be a farmer, and that he should find success in life's endeavors in the tilling of the soil. Our subject's father, Austin Rice, was born in Worcester, Massachusetts, in 1834, his father coming from England when he was a young man; our subject's mother's maiden name was Clara Clark, born in 1840 in Worcester, Massachusetts. Mr. Rice's parents came to Nebraska in 1882, settling south of Clearwater in Stanton township, Antelope county, where they took up a homestead on which they built a sod house and resided there eight years. Our subject then moved near Royal where he rented for nine years. He then bought a tree claim from S. A. Boyd, the claim consisting of one hundred and sixty acres of land in section one, township twenty-seven, range eight. Later Mr. Rice sold this homestead and bought the southwest quarter of section one, township twenty-seven, range eight, which is well improved and is now the residing place of our subject. He devotes a good deal of attention to fine hogs and now owns about seventy-five full blooded Duroc Jersey bogs, subject to registration, mostly sired by Red Chief "I Am," some from "Nebraska Bell," and "Failor's Model." In 1892 Mr. Rice was united in marriage to Miss Mary Ludwick, and Mr. and Mrs. Rice are the parents of six children, named as follows: Clarence, Alva, Floyd, Roy, Austin and Lewis. They are a fine family and are highly esteemed and respected by all in the community. Mr. Rice relates many interesting reminiscences concerning early days in Antelope county. He and his two brothers were at school when the great blizzard of January 12, 1888, came up. They started for home which was one and a half miles distant. His brothers were not able to continue so stopped at a neighbor's house, about eighty rods from the school; but he continued on his way home, keeping the road by watching closely some tracks that had been made by hand sleds that they took to school with them and thus he managed to get home safely. William T. Hickenbottom has been a resident of Nebraska since 1873, and during that period has witnessed the wonderful changes and development of the state. He passed through all the trying incidents and privations of pioneer existence, and has always been identified with the best interests of his state. He was born in Jefferson county, Iowa, April 2, 1851, the third child of Stephen and Caroline (Taylor) Hickenbottom, who were parents of four sons and eight daughters. The father was a farmer and stock raiser, and Mr. Hickenbottom was reared on a farm. His parents are now deceased, his mother having died at his home January 30, 1911. His brothers, James and Rollo, live in Custer county, where they are prominent as farmers and stockmen, and three of his sisters, Mrs. Sarah Moore, Mrs. Chris Jensen, and Mrs. Jane Eastman, live in Custer county. Two sisters live in Fairfield, Iowa, one in Washington, and one in Oregon. his home on the former, which was located on section six, township sixteen, range seventeen, which remained the home place until he came to his present home in Broken Bow, in September, 1909. Mrs. Hickenbottom died on the home farm in 1885, survived by her husband and two children. On January 15, 1889, Mr. Hickenbottom was married in Jefferson county, Iowa, to Ellen May Griffith, a native of Iowa, and in the spring of 1889 they came to their Custer county home. They have had four children, of whom three survived: Carrie, Abbie, and Leota, at home. Mr. Hickenbottom's two oldest children, James W., and Rose Ann, by his first marriage, both live on the Kincaid homestead in Cherry county, Nebraska. He is married and has three children, and she is the wife of Durfee Hyatt, and has one child. Mr. Hickenbottom came first to Nebraska with a span of horses and little else besides a bridle and saddle, and through his own efforts has become one of the successful farmers and stock men of central Nebraska, owning over twelve hundred acres of well improved and developed land. Both he and his wife are well-known and popular in social circles and are highly regarded by their many friends. Mrs. Hickenbottom's parents, John and Sarah Griffith, reside in Keokuk county, Iowa. Her sister, Mrs. Byron Brewer, lives in Rock county, Nebraska, and her brother, Emery Griffith, lives nine miles south of Broken Bow. She also has three brothers and one sister living in Iowa. One of the best known citizens of Custer county is Hall B. Schneringer, who has always been closely identified with the cause of progress and advancement along all lines, He was born in Jefferson county, Iowa, September 1, 1849, eldest of the four children of Frederick and Rachel (Van Horne) Schneringer. The other children are: Mark, of Callaway; Frederick, of Lincoln; Mrs. Strong Billingsley, of Belleville, Kansas. The father was born in Germany and the mother in Ohio. He served in the German army, and came to America when a young man, locating first in Maine. He died in 1872 and his wife in 1860, both in Iowa. She was of Irish descent. Mr. Schneringer grew to manhood on the farm in Iowa and received a common school education, later engaging in farming. On August 20, 1868, at St. Louis, Missouri, he was united in marriage with Miss Missouri J. Mendenhall, a native of that state, and they made their first home on the old homestead in Iowa. In February, 1877, they came to York county, Nebraska, and lived there three years, coming with their four children to Custer county in the spring of 1880. They took a homestead and tree claim aggregating three hundred and twenty acres of land on section eight, township fifteen, range twenty-three, Which remained the home place for a period of thirty-one years. On January 8, 1905, Mrs. Schneringer died on the home farm, survived by her husband and eight children: Charles G. and Jennie, twins, the former living in Perkins county, and the latter, the wife of James Baldwin, of Forest Grove, Oregon, has two children; William E., of Custer county, is married and has three children; Mark lives in Custer county; Rachel Bell, wife of Lawrence Rotten, of Lincoln, has three children; Arthur, living near Cozad, Dawson county, Nebraska, has one child; Roy, of Callaway; Ada May, married and living in Oregon. In the fall of 1880 Mr. Schneringer was instrumental in organizing school district number three, which was supported for a time by private funds, and for several years he served on its board. In 1887 he was elected county supervisor, served three years, and was again elected in 1904, serving two years. He has also served as justice of the peace and at present is assessor of Delight precinct. In March, 1910, he retired from the farm and purchased his present comfortable home in Callaway. He was a progressive and energetic farmer and stockman and is now the owner of three hundred and twenty acres of well-improved and equipped farm land. He is highly regarded as a public-spirited and useful citizen and has a large number of friends. He is a member of the Odd Fellows fraternity. On October 5, 1905, Mr. Schneringer married Mrs. Mary (Hougland) Rhodes, a native of Indiana, and a daughter of Samuel and Eliza (Turbeville) Hougland. Portraits of Mr. and Mrs. Schneringer appear on another page of this work. 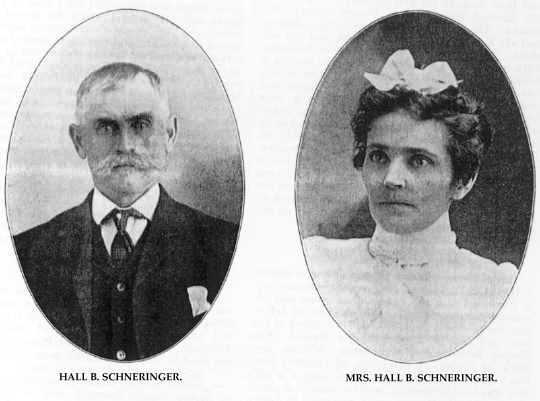 Hall B. Schneringer & Mrs. Hall B. Schneringer. Jesse G. Barnett, whose fine farm in Pierce county is a credit to his locality, is a man of untiring energy, and is classed among the weathy and substantial agriculturists of that county. Although not an old settler of Pierce county, he has lived in eastern Nebraska some years, and enjoys the esteem and respect of many. Jesse J. Barnett was born September 6, 1867, in Barton county, Missouri, and is the son of James and Jane (Knowles) Barnett, of Irish descent. His father was a Union soldier in the Civil war, serving four years and a half in Company K, Thirty-third Illinois Volunteer Infantry, among the engagements in which he participated was the siege of Vicksburg. He settled in Missouri soon after the war, and here and in Appanoose county, Iowa, reared his children. He came to Saunders county in 1882, where he rented a farm for a time. He later owned land, retiring in 1905 to make his home in Fremont. twenty-seven, range three, in Pierce county, which, was improved with good buildings. He has since added much to the number of trees growing on the place when purchased. This farm is now his residing place. Mr. Barnett was married in Fremont to Miss Maggie Larson, a native of Morgan county, near Jacksonville, Illinois. She is a daughter of Christian and Hanna (Peterson) Larson, who emigrated from Denmark about 1870. Five children have been born to Mr. and Mrs. Barnett, whose names are as follows: Earl, Hazel, Leo, Delbert and Floyd. Mr. Barnett was a member of the Ancient Order of United Workmen, and has always cast his vote for the republican ticket. He takes an active interest in neighborhood affairs, and is liked and respected by all who have the pleasure of knowing him. During the blizzard of January 12, 1888, he was out in the storm for some time, looking after cattle, but his father's farm being surrounded by a large grove, he suffered little inconvenience. During the drouth of 1894, they gathered but ten bushels of corn per acre - much more, however, than other families secured. The above named gentleman is a young man, widely known and highly respected for his sterling character and industrious habits. He is a successful and prosperous agriculturist and stockman of Howard county, where he has spent his entire life. Alfred L. Baliman was born on March 5, 1879, on the original Baliman homestead in section twelve, township fourteen, range eleven, his parents having settled in this county in the month of April, 1871. He received his early education in the district schools, afterwards attending the St. Paul high school, and for three years was a student at the St. Paul College, being the first pupil enrolled in the college. After leaving school, he engaged in different lines of work, spending nearly all of his time in St. Paul, where he accomplished a large measure of success, but finally returned to the farm, and for the past number of years has given his entire attention to agricultural pursuits. At the present time he is the owner of a fine property, consisting of one hundred and twenty acres, and in connection with this place he operates his father's homestead of two hundred and forty acres. He engages in mixed farming, and stock raising, having a thoroughly equipped farm, and is rapidly becoming one of the foremost members of the younger agriculturists of his vicinity. Mr. Baliman was married at Loup City, Nebraska, on October 15, 1902, to Miss Pearl Daddow, who is a native of Iowa, and came to Nebraska with her parents when a very young child, her father, Samuel Daddow, being one of a family of six brothers who located in Sherman county as pioneers, and remained to see that region develop from a practically barren plain to a productive farming country and thriving business center. Mr. and Mrs. Baliman have one child, Percy La Clair, who is a bright and interesting youngster. The family have a very pleasant home, and a host of warm friends in the community. Mr. Baliman is treasurer of school district number eight. Among the most prominent citizens of Arcadia, Nebraska, is Henry H. Waggoner, who has for many years been identified with the interests and development of Valley county as business man and farmer. He is one of the older residents, and during the many years that have passed since he first came to the county, he has done much toward the upbuilding of the town of Arcadia and the welfare of the surrounding country. He is a native of Freedom, Ohio, born October 22, 1847, a son of Samuel and Louisa (Ferguson) Waggoner, being the eldest of their three children -- two sons and one daughter. The Waggoner family migrated to Davenport, Iowa, in November, 1864, and in the following spring removed to a farm near Rock Island, Illinois. In 1867, the father sold his farm near Rock Island, and located in Mercer county, Illinois, where he died in November, 1868. His widow passed away at Perry, Iowa, in February, 1902. Their only daughter, Louisa, married Abraham Maus, and they live six and one-half miles southwest of Lincoln, Nebraska. The son, George, has interests in Iowa and Oklahoma. sixteen. He is a successful man, and owns considerable land. He is actively interested in public affairs, and is well known in Valley county. Two children were born to Mr. Waggoner and wife, Belle and Florence. Belle is the wife of Frone Ring, of Calhoun county, Iowa, and they have four children. Florence married (first) A. J. Benitt, and they had two children, both of whom are living. She and her second hushand, Frank Roach, live in North Dakota; a son was born to them, August 8, 1911, and named Franklin Waggoner Roach. Mrs. Waggoner died in Arcadia, May 6, 1906, and Mr. Waggoner married (second), April 24, 1907, Mrs. Martha Dunkin. Mr. Waggoner is a republican in politics, and a member of the Masonic fraternity and of the Royal Highlanders. H. C. Twing, one of the pioneers of northeastern Nebraska, is known throughout Madison county, where he has lived for the past twenty-seven years, as a prosperous and energetic agriculturist. He has been closely identified with the development of this region since his coming in 1883, and his name will occupy a place in the making of history in this part of the country. He resides on section thirty-six, township twenty-two, range one, west, where he owns a good home and land. Mr. Twing is a native of Fon du Lac, Wisconsin, born May 1, 1844, and is a son of Marcus and Eliza (Clark) Twing, both of whom were born in the state of Ohio. He is a descendant of Italy, his ancestry dating back to the year 1600, when the original Italian Twing left his native soil, and emigrated to England, and then came to the United States of America. Our subject's great grandfather, Calvin Twing, served in the Revolutionary war. Mr. Twing remained in his native state until reaching the age of twenty-four years, when, in 1868, he moved to Boone county, Iowa, where he lived several years. In 1883, he came to Madison county, Nebraska, where he bought railroad land and put up a dugout. This farm was west of Battle Creek, and remained the home of Mr. Twing until 1890. In 1891, he bought the Harry Heath homestead, his present home, and improved same. He now owns one hundred and twenty acres of fine land, two and a half acres of which are given to trees and orchard. In 1874, Mr. Twing was united in marriage to Miss Susan Flower, and they are the parents of six children whose names are as follows: Nettie, Lizzie, Norah, Edward, Agnes and Edith. Mr. and Mrs. Twing and family are highly respected in their community, and enjoy the good will and esteem of a large circle of friends and acquaintances. James A. Fisk, one of Custer county's earliest settlers, is well known as a successful man of affairs, and has been able to retire from active life with a well-earned competency. Mr. Fisk is a native of St. Lawrence county, New York, born November 27, 1849, son of James and Betsey (Pool) Fisk, the only one of their three children now living. Both parents were natives of New York, where the father died in 1849, and the mother died in Wisconsin in 1893. At the age of ten years, James A. Fisk accompanied his mother to Wisconsin, where he completed his education in the public schools. Upon reaching manhood, he engaged in farming and lumber business. November 13, 1887, Mr. Fisk married Mrs. Viola (Wood) Gaylord, a native of Wisconsin, and in the spring of 1889, they removed to Custer county, where they have since resided. They pre-empted one hundred and sixty acres of land near Westerville, and, after living for a time on each of several farms, purchased a stock and grain farm of one hundred and sixty acres, three miles from Ansley, their home for several years. Since 1905, they have lived in Ansley, where Mr. Fisk purchased twenty acres of land adjoining the city limits, and he has retired from active work. He took an intelligent interest in local affairs while living on his farm, and served some time as clerk of school district number ninety-six, also promoting every measure for the good of the community. Two children were born to Mr. and Mrs. Fisk: Alberta M., who married Sidney Hughes, lives at Alliance, Nebraska, and Etta L., at home. By her former marriage, Mrs. Fisk has two children: Grace A., wife of W. D. Bonner, lives in Canada, and has one child; and Floyd Gaylord, of Seattle, is married, and has one child. Mrs. Fisk has always been actively interested in educational matters. She formerly served as treasurer of school district number ninety-six, and is now a teacher in the Ansley schools. Her father, Hiram Wood, a native of Connecticut, served in the Civil war, and died in Iowa in 1880. Her mother, whose maiden name was Priscilla Hugoboom, was born in New York, and died in Wisconsin. Mrs. Fisk has three brothers and a sister living in Wisconsin, and a brother in Idaho, and two of her brothers served in the Civil war. She is a woman of culture and taste, takes an intelligent interest in all matters affecting the future and well-being of the region, where she has spent so large a part of her life, and is one of the most efficient teachers in the county. for many years a resident of the county, and has been among those who have labored long and faithfully to bring about its present prosperity and wealth. He has always had the better interests of the community at heart, has remained through discouragements and disappointments, and now enjoys a comfortable home, after many years of persistent labor. Mr. Meyer was born in Oldenburg, Germany, in 1852, and was the son of John Meyer. Both his parents died when he was only six years old, and he was brought up by his aunt. His childhood was spent in Germany, but as soon as he as able to shift for himself, he went to sea, and for years was a sailor. He also served two years and eight months in the German navy, most of the time being spent on the coast of China. In 1881, he abandoned his sea-faring life, and leaving his ship at Baltimore, came west to Mills county, Iowa, where he remained for three years. He then came to Wayne county, Nebraska, where he bought his present farm of one hundred and sixty acres, and proceeded to improve it. The farm is now a picture of thrift and good management, with all necessary buildings, fences, and its well-cultivated fields. He has an unusually fine, thrifty orchard of two acres, all the trees having been planted by himself. Mr. Meyer now owns two hundred and eighty acres of land. In 1888, Mr. Meyer was united in marriage to Miss Wilhelmena Hagen, an old-time sweetheart, of Germany. After his years of roving and hard work, Mr. Meyer had succeeded in making a good start in the west, and at once sent for is former sweetheart. They are the parents of five children: Fred and Willie, twins; Emil, Emma and Ernest. Mr. and Mrs. Meyers and family are members of the German Lutheran church. Among the representative pioneer families of Custer county, that of George A. Roper deserves prominent place. Mr. Roper is one of the original homesteaders of the county, and one of those who have justified their faith in the future development of central Nebraska. He was born in Oakland county, Michigan, October 28, 1856, fourth chiId of Thomas and Charlotta (Appleton) Roper, who were parents of four sons and six daughters. The parents, natives of England, came to the United States with their two eldest children about 1851, and eight of their children were born in this country. The father and mother reside in Wayne county, Michigan, both eighty-four years of age, having been married sixty-four years. Six of children are living: Andrew J., George A., and Mrs. James Rutner live in Custer county, and William in Dawson county, Nebraska, while Anton VanDyke and Mrs. Lottie Reed live in Michigan. Four children are deceased. Mr. Roper was born and reared on a farm in his native state, and was married in Livingston county, Michigan, December 31, 1880, to Miss Mary Compton, and in 1882 they moved with their one child, Emil, to Jefferson county, Kansas. In January, 1884, they came to Custer county, Nebraska. George Roper, with his brothers, Andrew and William, James Rutner and Michael Franey, came with horses from Kansas to Kearney, their families and a car of household goods coming by rail to that city. The men each took up a homestead in Nebraska. George A. Roper took up the south half of the northwest quarter and the north half of the southwest quarter of section thirty-five, township fourteen, range nineteen and he and his family still reside on the old homestead farm, which now contains four hundred acres of well-improved and equipped farm land. They have a comfortable home, and are extensively engaged in raising grain and stock. Mr. and Mrs. Roper have had five children, Emil, at home; Arthur W., married, and living in Blaine county, Nebraska, occupies a Kincaid homestead; Gladys, wife of W. C. Wheeler, of Custer county, has one child; Thomas C. and Thyra live at home. Mr. and Mrs. Roper passed through the early years of pioneer hardships and privations, and doubly appreciate their present success and prosperity. They have a wide circle of firm friends, and are well regarded by all who know them. Mr. Roper is independent in politics, a member of the Christian church, and fraternizes with the Modern Woodmen of America. The first ten years in Nebraska were spent in a soddy, and in 1893 their present frame dwelling was erected. Cornstalks were used for fuel for a time, and later a hay-burner was installed. The dry year, 1894, was one of hardship, two hats full of potatoes being their entire crop. Of those who for four decades have found success and a home in Nebraska, Raymond Hampl, of Spencer, is one.